Fingerless mitts are all the rage. They can be fancy or simple, long or short. 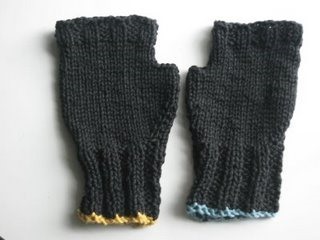 This article will show you how to make a simple pair of fingerless mitts—for men or women. By adding more colors in stripes or other patterns, you can make them more interesting. You can also add to the length to make them longer. This pattern is for women. Men's sizes are in (parentheses). Use a circular needle or #8 DP using softball cotton. Cast on 24 stitches (28). Knit ribbing for 2 inches (2½") or make the ribbing as long as you want. Change to the stockinette stitch. Increase 1 stitch each end, every other row, until 34 stitches (38). Knit for 3½ inches (4") more. Bind off 6 stitches (8) for thumb. Knit the rest of the stitches for 1½ inches (2") or until you think it's the length you need. Knit Ribbing for 2 (3) rows. Bind off the stitches in ribbing.